Click play (4) to view photos from this year's meeting. The ASF Annual Meeting brought together ASF members and key policy makers and legislators to discuss important market issues critical to the future of the securitization industry. It featured timely and relevant content and business networking activities that responded directly to the needs and interests of securitization market participants. The Washington, D.C. location allowed for significant representation from federal regulatory and legislative bodies. Speakers included high-profile regulators and legislators who provided updates and views on current and forthcoming developments affecting the industry. 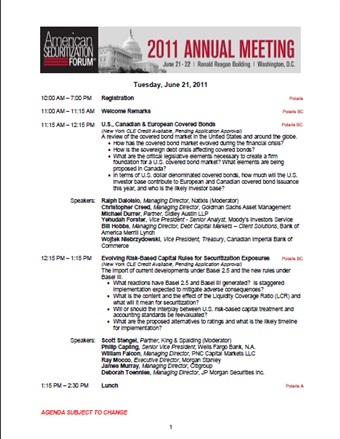 The ASF Annual Meeting included sessions which covered issues of broad interest to the industry, including the Dodd-Frank Act, risk retention, the state of the housing market, risk-based capital rules, and covered bonds, among many other topics. The Annual Meeting also featured keynote addresses by U.S. Securities & Exchange Commission Chairman Mary L. Schapiro , U.S. Senator Mark Warner, U.S. Representative John Campbell, U.S. Representative Gary Peters, and Ginnie Mae President Theodore Tozer. Click play (4) to view photos from last year's meeting. 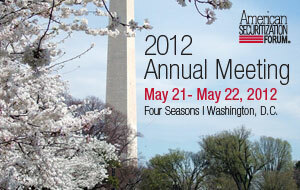 © 2004-2012 American Securitization Forum, Inc.